If you feel like a piece of sand is in your eye or your eyelashes are crusted together first thing every morning, you could have a condition known as blepharitis. That's the medical term for "eyelid inflammation." This condition can affect the outside front edge of your eyelid where your eyelashes attach. More commonly, you get it at the inner rim of your eye where your eyelid touches your eyeball. Most of the time, people get blepharitis in both eyes, but you could have it in just one. This common eye ailment can't be cured, but you can do things to feel better. Apply a warm compress: Do this twice a day for 15 minutes to loosen crust from your eyelashes and help get rid of extra oil that's plugging up your glands. Gently wash the area:After you take off the compress, use a cotton swab or washcloth to lightly clean the area with a mixture of baby shampoo and water. Rinse well afterward. Blink:This helps the glands in your eyelids squeeze out extra oil. Blink at least 20 times in a row, 4 times a day. Give your eyes a rest:Until your symptoms get better, don't wear eye makeup or contact lenses. Care for dry eyes:Use over-the-counter artificial tears to keep your eyes moist. 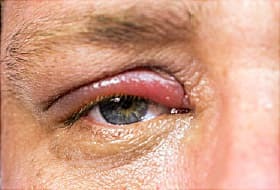 Get enough omega-3s:Some research suggests that a diet high in these fatty acids can help manage blepharitis symptoms. Have fish twice a week, and make one a fatty fish like salmon, fresh or frozen tuna, or herring. If your blepharitis doesn't getter better, see your eye doctor. She'll ask about your symptoms and look at your eye and eyelid. She may take a sample of any crust or oil that's there and send it to a lab to test for bacteria or fungus. This can also find signs of an allergy you might have but not know about. Depending on what's causing the inflammation, you may need to use antibiotic eye drops, ointment, or cream to help clear up your symptoms. You might need to use the treatment for 4 to 6 weeks. If that doesn't help, your doctor may give you antibiotics to take by mouth. Blepharitis is often a long-term problem -- your symptoms may come and go. Take good care of your eyes, and see your doctor if your symptoms get worse. American Academy of Ophthalmology: "Managing Blepharitis: Tried-and-True and New Approaches." National Eye Institute: "Facts about Blepharitis." American Family Physician: "Eyelid Disorders: Diagnosis and Management."